SOMERVILLE, Mass. -- Dan Futrell had an idea so out-there, it might just have been possible: solve a great plane crash mystery by finding the wreckage, CBS Boston reports. “I said ‘Hey we should try and go find this thing. It’s also at 20,000 feet. We’ve never been that high,’” said Futrell. The two friends set off earlier this year to find what no one else had. 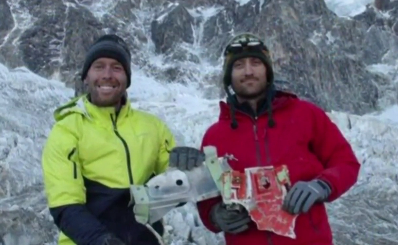 They found the debris field about 1,000 feet below the believed crash site. They think melting glaciers revealed much of the wreckage. Among the plane parts were six pieces of the black box, which is really orange. They found their holy grail -- part of the voice recording -- stuck in the ice. They brought it back the U.S. and the feds’ first response was not what they expected. “You effectively violated international law. We advise you to send it back to Bolivia,” said Stoner. They had traveled too far. They went on a campaign to get Bolivia interested, and give the OK for the National Transportation Safety Board (NTSB) to take a look. This week, the two said the agency finally reached out saying they could see what, if anything, is on the tape. As Futrell and Stoner wait, their journey alone has already provided closure for the families. “All of them at the end essentially said, ‘Hey, thanks for doing that,’” said Futrell. They said the NTSB is picking up the black box in the first week in January. The NTSB did not comment.